When buying a new communications receiver today, the most important question is whether to opt for a traditional table-top receiver, or a PC-controlled receiver. The choice is not easy, although software-defined receivers (SDR) are improving all the time. Winradio has recently introduced its latest PC-controlled model WR-G313e, which is basically an external version of an earlier WR-G313i receiver. For a DXer interested in distant mediumwave and shortwave stations, G313e turns out to be good value for money. 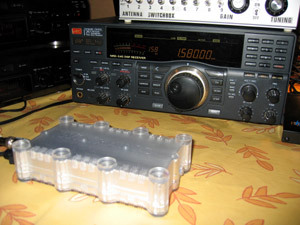 The receiver fares very well in hectic DXpedition use, but not entirely without shortcomings. 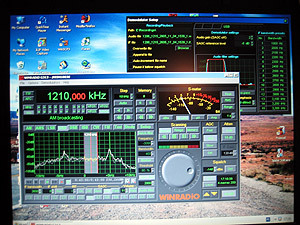 Winradio (or WiNRADiO as the Australian company prefers to be spelled) officially introduced its latest software-defined receiver on October 29, 2005, and kindly provided the receiver for review. Winradio WR-G313e is an HF receiver (9 kHz to 30 MHz, optionally extendable to 180 MHz) with a USB interface. The earlier model (G313i) was built on a PCI card, so the new G313e is better for mobile use. It is easy to pack and take along with a laptop PC. Otherwise the receivers are identical, and so is the software running them. WR-G313e is reviewed here based on usability, and on how well it fits the needs of DXers hunting for rare mediumwave and shortwave stations. The receiver has other uses as well, and DXers can have other priorities. I have compared G313e to my JRC NRD-545 DSP receiver, and briefly in DXpedition conditions also to JRC's previous model, NRD-535G. It must be taken into account that NRD-545 is much more expensive - sold for around $1800-1900 in the US and €1800-2200 in Europe - than G313e, which is priced at around $1200. The hardware part of G313e is a simple box (measuring 16 x 9 x 4 cm) with an on-off switch and an indicator light in one end, and a power jack, USB interface and antenna plug in the other. An AC/DC adapter and all necessary cables are provided. 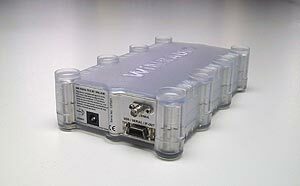 The receiver uses an SMA antenna connection, but a BNC adapter is included. A beginner's antenna is included, but you should always use a proper outdoor antenna for any serious use. Software comes on a CD-ROM and is easy to install. The user's guide is detailed and user-friendly. According to system requirements, G313e works with a minimum of 500 MHz CPU and 64MB of RAM, although 1 GHz and 256MB are recommended. I would go further; an even more powerful PC is needed, because in practise you would likely be multitasking. My lap-top is faster than recommended, but I still experience constant breaks in playback of IF recordings made with G313e. I first suspected that slowness was due to a slow USB connection (1.0), as I used a separate USB hard disc to store IF recordings, but there was no improvement when I moved the sound files to the lap-top's own hard drive, nor when I closed all other visible applications. G313e by the way is compatible with both USB 1.0 and 2.0 standards. Software always has its pros and cons. A software-defined receiver is like good wine, improving as it matures, because the software is constantly developed and upgrade downloads are free. Of course, there is no way around hardware limitations. However, as any PC user can testify, software tends to cause nasty surprises. Even though a particular piece of software would be fine, interaction with other software is sometimes problematic. 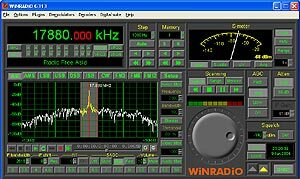 In my case the system kept on crashing on my tabletop PC, until Winradio engineers figured out the problem and amended the software - it turned out that an existing driver in my system didn't get along with Winradio. Electrical interference can be a real nuisance in low-noise environments, so if you are using a PC-controlled radio, your PC and AC/DC adapter are potential risks. However, I didn't notice any interference from my Compaq laptop nor from the power adapters of the PC or G313e. User interface resembles a traditional communications receiver, making it intuitively easy to use. Frequency controls are placed in the upper left corner; with mode and bandwidth controls below. S-meter occupies most of the upper right corner, with scanning, AGC, attenuator and a large tuning knob below. Recording and playback keys are located right below the spectrum display. Preferences in the locations of various controls are very personal and depend on what you're used to. As this is all defined by software, perhaps a step forward would be the possibility to drag and drop various parts of the interface where-ever you want them to be located, and hide controls which you don't need on a daily basis. Additional buttons on my wish-list would be quick access buttons for memory files. There should be at least 10-20 such small buttons, one for each memory file. This would make changing from one memory file to another much faster than the present system of opening boxes and files in the traditional Windows way. but as I have been reminded, on the market there are hardware tuning knobs as accessories for nostalgic users. A newer function is "tune to peak" which automatically finds and tunes to the strongest signal within the IF range, but this is useful mainly in FM or utility listening. Frequency-hopping steps can be adjusted freely. In practise you can try 9 and 10 kHz intervals on mediumwave and 5 kHz on shortwave. To switch frequencies, I prefer to use page up/down keyboard buttons instead of clicking the small controls on the software interface. Instead of frequency stepping, I still prefer to store MW and SW frequencies in a memory file, because it allows you to for example preset the better sideband separately for each frequency. On the downside, page up/down doesn't work when browsing memorized frequencies, so it is not quite as convenient as regular frequency stepping. All necessary broadcast modes are supported, including DSB (dual sideband), not found in conventional receivers. ISB (independent sideband) gives you the option of recording both sidebands simultaneously as a stereo recording. There are several ways to set the bandwidth. A row of 15 fully adjustable buttons shows a range of preset values for each mode. There is also a control button with a slider to adjust bandwidth, or you can type the bandwidth. I would normally use SSB and a bandwidth of 2.7-2.9 kHz. All the necessary controls are included, such as pass-band tuning (PBT), automatic gain control (AGC), notch filter and noise blanker. There is actually a double-AGC, a hardware AGC and a software AGC, which can be operated independently. The notch filter is remarkably effective and easily adjustable. It seems to work as well as that of NRD-545, which is superior to previous JRC models. As a bonus, you can even adjust the width of the notch filter. An audio filter (located and defined under a separate setup page) can and should be used to improve sound quality, which of course is a highly personal matter. In my opinion the NRD-545 still has better sound quality. In G313e, a decent sound quality is achieved by cutting off audio below 250-300 Hz. The upper limit would normally be defined by your bandwidth. To take full advantage of the range of controls available, it is a good idea to make an IF recording (see "Recording" below) whenever you are monitoring something important, and play with the settings safely afterwards. A striking novelty compared to conventional receivers is a large real-time spectrum display, a feature that has been confined to top-class communications receivers, but is standard in software-defined receivers. Normally the spectrum trace would move so rapidly that I prefer to smooth the image with a video filter (mine is set at 3000 Hz). In addition to the previously listed tuning and bandwidth setting methods, you can use a slider on the display to change frequency or set the bandwidth. The display of course doesn't improve reception a single bit, but I admit that it is fun to also "watch" what you're listening. Though not really a memory, four VFO buttons located next to the frequency display in practise allow you to have three additional "fast" memory channels just a click away, without needing to browse your memory files. This may be useful especially during those crucial seconds when you are hunting for a top-of-the-hour station identification, enabling you to earmark the most interesting ones for instant access. The same outcome with even more channels can be achieved through the memory function, but setting the memory channels takes much more time. 11 stations in each memory file can be assigned a hotkey (one of the function keys on the keyboard) for quick retrieval. 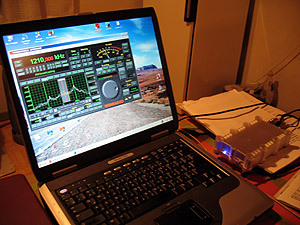 Two receivers that have enough memory capacity; JRC NRD-545 (behind) has 1000 memory channels, but Winradio WR-G313e even more. The memory capacity is in practise unlimited. Each memory file can hold 1000 channels, and you can create as many memory files as you can fit in your computer. For example mode, IF shift and bandwidth can be stored with each memory channel. Also a short text can be associated with each memory channel. This can be used for example to indicate the name, call, slogan or format information of the desired station. Initially I started copying the same frequency list which I had created for my NRD-545 as a single 1000-station long memory file, but it turned out to be unpractical. I had listed the same frequency in various contexts (1260 kHz for example has interesting stations on several continents), but G313e however only showed one station name with each listed frequency, so in many cases the text shown would refer to a wrong station on the same frequency. So I decided to create memory files with a narrow scope, one for each target area, country or even one file for a single network (such as Japanese NHK-1 stations). In addition, for more general purposes, I have created for example a file containing all MW channels at 9 kHz intervals. The settings have of course been made according to my preferences (for example bandwidth at 2.6 kHz), and either LSB or USB has been chosen to avoid nearby American frequencies (each 10 kHz) as well as European DRM transmissions on adjacent channels. You can download it here, and modify according to your needs, so you don't need to start from scratch. I think it would be excellent customer service if the manufacturer could provide a library of memory files for different uses. An essential part of any serious DXing is recording what you hear for future research. G313e has an integrated recorder with playback. Recordings are automatically saved in standard .wav format, which is sufficient, but a possibility to use .mp3 would save disc space. As recording is part of the software, we can hope that MP3 recording would become possible in the future. If you have a clear signal and there is no doubt about what settings are the best, regular recording is the way to go. However, if there is any kind of interference or noise, or if you would need to change any settings at any point, you should opt for IF recording. IF recording saves a 20 kHz wide frequency spectrum, meaning that for example on the mediumwave band (where stations are either 9 or 10 kHz apart), you can record two (but not three) frequencies simultaneously. On shortwave, in case stations are 5 kHz apart, you can monitor even three channels. Here is an example of what a graveyard watch done with IF recording netted during my recent DXpedition to the Finnish Lapland. On Sunday, October 30, I monitored 1230 & 1240 kHz most of the time from 0730 to past 1300 UTC, using an antenna pointed at 336 degrees. This is the antenna to listen to US and Canadian stations west of the Rockies. Conditions were relatively good, though steadily focused on Oregon, from where the usual suspects were heard. On 1230 kHz, aside from CBQC Ft. Providence NT (with national CBC programming), KKEE Astoria OR was identified at 0800, 1156-1200, 1256 and 1300 UTC. KORT Grangeville ID was heard briefly at 1023 UTC. A couple of unidentified stations were present, probably including KMUZ Gresham OR, judging by the format. On 1240 kHz, KTIX Pendleton OR was dominant, identified at 0743, 0759, 0900, 0903, 1200 and 1203. KWIK Pocatello ID was identified at 0759, KQEN Roseburg OR at 0919, and KEJO Corvallis OR at 1300 UTC. Although it takes more disc space, IF recording is a real time machine. It records everything that happens on the chosen segment. During playback, you can change frequency up to 7.5 kHz (with the settings that I have used) in either direction, and you can change and compare any demodulator functions (mode, bandwidth, notch filter etc) as much as you like, and always find the ideal settings for the final recording. Especially on DXpeditions you sometimes encounter so good conditions that you don't really know what to choose from the multitude of interesting stations. IF recording can double your chances. For example, on my recent LEM214 DXpedition I would often set the IF recording at 1235 kHz, whenever North American stations were audible on the graveyard frequencies of 1230 and 1240 kHz (see box above right). Here are a few examples of recordings made with different settings. CFUN Vancouver BC on 1410 kHz is a common station in Lapland, this station ID was recorded on November 1, 2005, at 0806 UTC. AGC was set at medium, audio filter cut-off low at 300 Hz either on or off. MP3 format (22050 Hz, 48 kb/sec, mono). Note also that there are short blackouts and breaks in just about every recording because of computer not being fast enough. Also note that under more interference, SSB and filter use would make a much more significant difference. IF recording was exceptionally useful when monitoring channels with one or more signals that were off the nominal frequency. Normally, if you would use LSB/USB while listening, and any signal would be roughly 0.05 kHz or more off, you would need to choose what to monitor, and lose other signals. With IF recording you can catch all signals no matter how far off they are, and adjust IF shift individually for each offset station during playback. In practise this is very convenient especially with Latin American and Philippine AM stations, as well as X-band Australians, but there are unstable AM stations on all continents (see box on right with audio samples). IF recording is so neat that it makes you wish that the frequency range would be even wider, allowing you to capture larger segments of the band, which is indeed possible with some other software-defined receivers. Then you could easily spend the rest of the year reliving your DXpedition highlights. G313 has comprehensive scanning functions, which are of limited use for a broadcast band DXer, whose main problem is to find an interesting station among others considered as interference, and not so much to spot an isolated signal from a large frequency spectrum full of only noise. Another feature less used by BCB DXers is a spectrum analyzer, which in itself is of course a nice function not traditionally included in a receiver. Unlike the spectrum display in the demodulator panel (part of the front user interface), the spectrum analyzer - which opens an extension to the interface - can cover a wide frequency range. The spectrum analyzer constantly sweeps across the desired frequency spectrum creating a graph illustrating all signals. This may be useful if you are listening in low-interference conditions, and want to keep an eye on a range of normally empty channels, in the hope of something to pop up. A nice asset for the future is that a DRM decoder can be added as a plug-in to the receiver, for a price though. G313e is sensitive enough for serious DXing, and according to measurements published earlier, sensitivity is very stable across the frequency range. During the few weeks that I have used the receiver, the same stations have been audible on both NRD-535/545 and G313e. However, occasionally overloading seems to be a problem. I noticed this especially on two instances. At home I have a 50-kilowatt MW transmitter just 10 kilometers away, causing spurious signals. Also on a DXpedition in Lapland, where interference levels are much lower, I still got a lot of unwanted spurious signals on the extended MW band (1610-1700 kHz), when I was hunting for weak Australian stations using huge beverage antennas. NRD-545 had the same problem to a lesser extent, but a modified NRD-535 fared somewhat better than NRD-545. G313e already has excellent usability, and further improvements can be expected in the future as the software is developed. JRC NRD-545 excels in usability, when compared to previous NRD models, but in many respects, G313e goes even further and provides much more versatility in controlling various receiver functions. NRD-545 was the first NRD model to have enough memory channels, but also here the software-defined G313e is superior. Ergonomics is more a matter of taste. If you are comfortable with using a mouse, ergonomics is not an issue, and the receiver is a pleasure to handle. Winradio has trademarked its slogan "
the future of radio" - and indeed, G313e certainly is an indication of where receiver development is heading to. In my opinion, G313e doesn't yet take us far enough into the future to say goodbye to the best conventional table-top receivers, but it is still a great receiver packed with a lot of new exciting and useful features.